July | 2010 | Renowrites blog! I attended Comic Con in San Diego this past weekend. To me, the vampire couldn’t be ignored, especially since I attended the “Popularity of Vampire Literature’ panel, an all-star collection of authors I admire. Richelle Mead (Vampire Academy), Charlaine Harris (Sookie Stackhouse Series), Rachel Caine (Morganville Vampires), Heather Brewer (Chronicles of Vladimir Tod), Christopher Farnsworth (Blood Oath: The President’s Vampire), Chris Marie Green (The Vampire Babylon Series), and Jeanne C. Stein (the Anna Strong Series). I really appreciated their candor about the future of publishing and their personal stories in getting published. The room was packed with goblins, superheroes and yes, vampires. As the teenage girl next to me kept repeating “OMG OMG OMG!’ in fan worship, it hit me how much authors have to step outside of their comfort zone. Writing is a solitary craft, but in today’s publishing world, authors not only have to write, they have to promote their work in the public eye. A great lesson to take away from these successful authors. After the panel, I went over to the Community panel to see Chevy Chase and my new favorite actress Alison Brie. 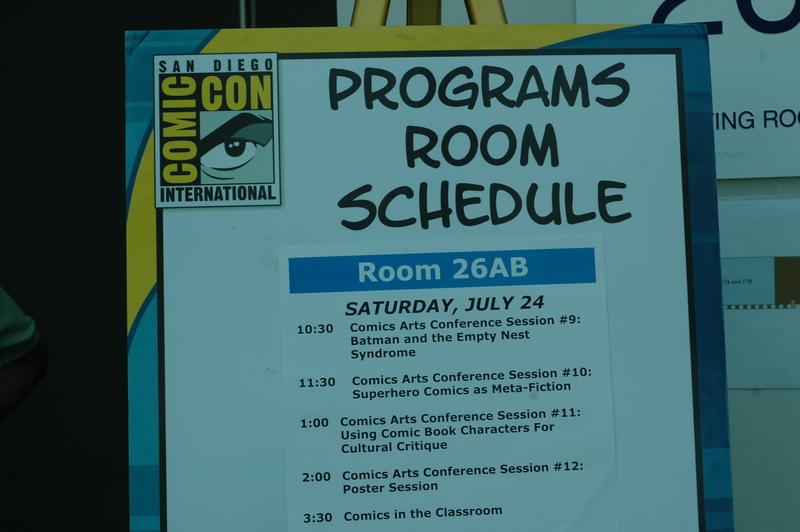 Comic Con – I plan to be back next year! I’ve always wondered why there aren’t more Filipino writers who are household names. I’m sure pundits will say there’s a lot of Filipino writers out there, but I argue that they lie in the shadows, their talents vastly unknown to the world. I’m a fan of many contemporary Filipino writers – authors Melissa De La Cruz, Jessica Hagedorn, Cecilia Brainard, Oscar Peneranda, Mel Orpilla, and Marjorie Evasco come to mind. They are, in my opinion, great writers. Melissa De La Cruz I would say has sold the most books, with Jessica Hagedorn close behind her. Melissa’s novels targets the YA teen market in America, so my assumptions are based on her genre and subject matter, while Jessica’s is more artistic, which I believe caters to more niche crowd. But in the relative mass market scheme of things, they are still trying to emerge from the shadows of other contemporary writers like Stephenie Meyer, Jodie Picoult, Nicholas Sparks, Kristin Hannah…well the list can go on forever. I think this is something that cannot be disputed based on book sales. I wonder why this is the case, besides the fact that most writers, regardless of ethnicity, live in obscurity. When I think of the greatest Filipino writer of all time, Mr. Jose Rizal I’m reminded how it takes an entire army of people to make a profound change in the world. Unfortunately, if you ask any ordinary Filipino American teenager or young adult who Jose Rizal is, I would say the vast majority of them would look back at you with blank stares, his revolutionary work El Filibusterismos almost forgotten with the new generation of Filipino Americans. In my opinion, most Filipinos just aren’t into writing anymore. We are a people who love to eat, party, socialize, watch tv, films, sports, youtube, and post witty comments on Facebook. In my opinion, there just isn’t enough interest to write in the Filipino community. So when new Filipino authors emerge, I become intrigued and hopeful. I’m super excited about Miguel Syjuco, a Filipino author, who is gaining praise for his debut novel Ilustrado’s. I have yet to read it, but can’t wait to see how Syjuco wraps his Filipino journey into English prose. A new author like Syjuco keeps me hopeful.